Born in Samarkand (Uzbekistan) 1907. Studied with V.V.Obratsov, Pishpek (Kirgizia) early 1920s; at 1905 Art Tekhnikum 1926-28; at Moscow VKHU - Polygraphic Institute 1928-32; at Tretyakov Gallery as post-grad. 1932-35. Active in Pishpek/Frunze, Kirgizia, and Soviet far east 1920s-c.1940; Kishinev, Moldavia, thereafter (evacuated to Tashkent, Uzbekistan, c.1941-c.1945). Began exhibiting 1929. Important shows include "All Union Art Exhibition", Moscow, 1946, 1951, 1952. Painted landscapes, thematic pictures. Well known works include "Pravda" has Written about Us (1951; private collection). Taught at Kishinev Art college 1961 - 65. Also a poster artist World War II. Died 1975 in Kishinev. 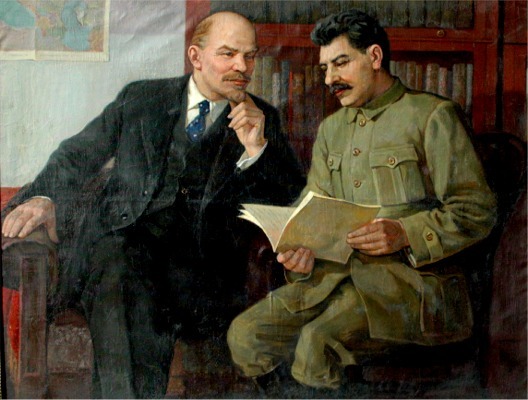 "Lenin and Stalin", oil on canvas, 121 x 158 cm. "Stalin", oil on canvas, 191 x 95 cm.